After a quick recipe to pull together in less than an hour? 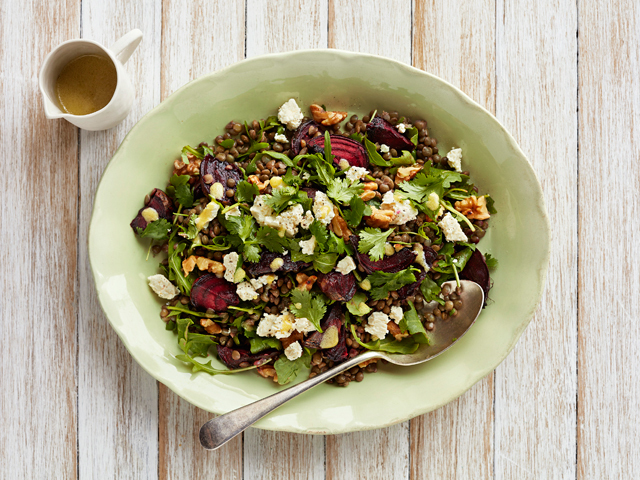 McKenzie's Lentil, Beetroot and Feta Salad is ready to go out the door in 40 minutes. Tips: Replace tinned beetroot, with warm roasted fresh beetroot. In a medium saucepan,bring the French Style Lentils, water and bay leaf to boil over medium-high heat. Reduce the heat and simmer until tender, about 25 minutes. Drain off any excess water and remove the bay leaf. Combine olive oil, lemon juice, Dijon mustard, crushed garlic , salt & black pepper . Pour over warm lentils and lightly toss. In a serving bowl, lightly toss the dressed lentils together with the red onion, baby beets, parsley and coriander. Top with crumbled feta.